My dad is an automotive technician so I developed my love for cars at a very young age. While he fixed and maintained cars, I always enjoyed modifying my cars. None of the cars I’ve owned in the past were kept stock for very long, no matter how minor the mod was. I had no problems spending endless amounts of money on car parts, in my younger days. But I also have two young children the ages of 3 and 5, so car parts are very low on my priority list unless its maintenance related. Last June I bought my first remote controlled (RC) car – an Axial SCX10 Jeep Wrangler G6 Falken Edition rock crawler. It was a ready-to-run (RTR) rock crawler that was all assembled and needed a battery. 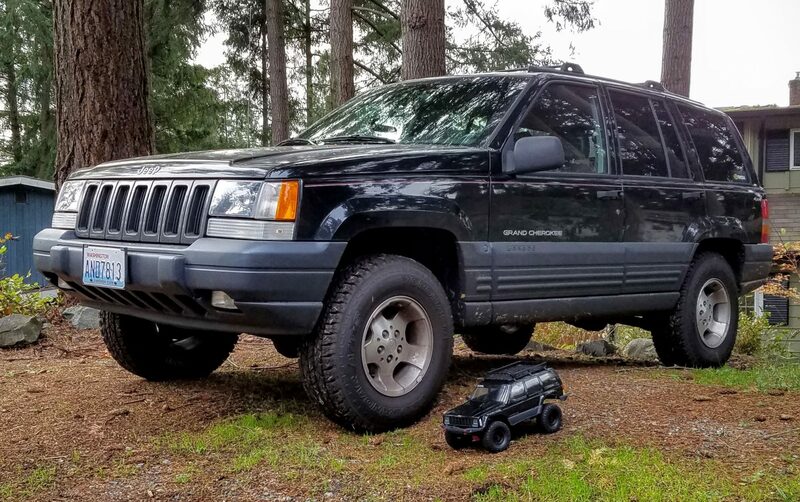 I love Jeep’s and have a 1997 Grand Cherokee Laredo 4×4 V8 that’s lifted 2-inches on 30-inch Yokohama Geolandar A/T-S tires, so a Jeep RC car was logical. Since June, In the last four months, I upgraded my little Jeep Wrangler with better suspension parts, motor, gears, radio (the remote control), LED lights and completely rebuilt it from the frame rails twice. Essentially, I can modify my little RC car as much as I want and spend a fraction as much on parts as my big Jeep. It also satisfies my desire to mod and wrench on a car, albeit at a smaller scale. The little Wrangler comes with me when hiking with my family. My oldest daughter enjoys playing with it too. It’s a good way for me to teach her the patience of off-roading, why weight balance in a car matters and throttle control, or so I tell my wife. 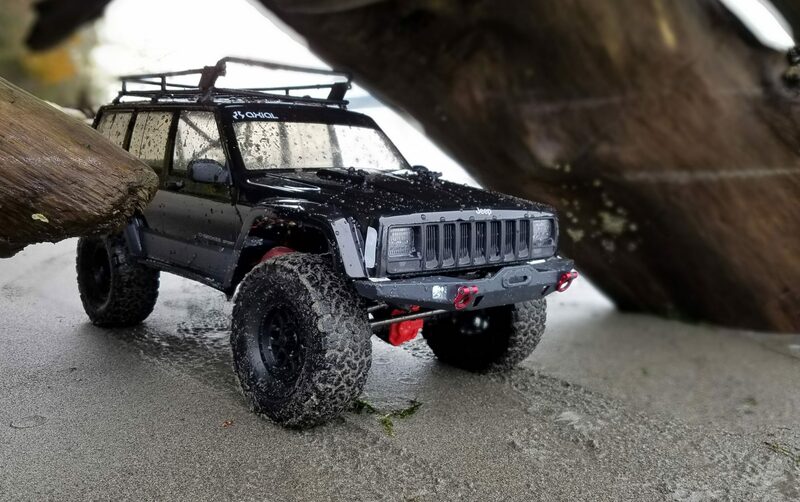 Last week I took the plunge and bought a new RC crawler, an Axial SCX10 II Jeep Cherokee. It arrived as a box of parts and a lexan shell that required complete assembly and painting. One of my regrets with the Wrangler is buying it as an RTR instead of a kit. I was afraid a kit would be too complicated for a newbie starting out in the world of RC, but after dismantling and rebuilding the little Wrangler a few times, I was confident in my building abilities and was sucked into the black hole of RC car building. The Axial SCX10 II kit contains most of the items you need to build an RC rock crawler, minus the electronics. Everything arrives in neatly packaged and labeled plastic bags to make finding what you need a breeze. 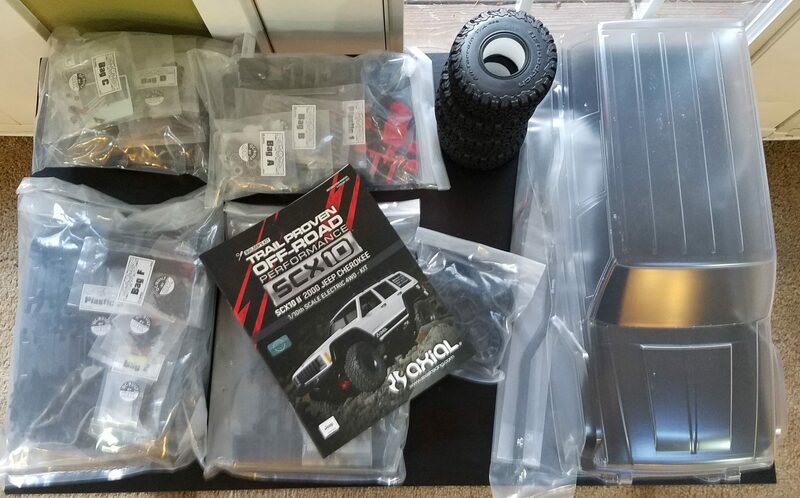 Axial includes detailed assembly instructions that covers every part from the differentials to the roof rack. The body is clear and needs trimming, drilling and paint to complete. Tools aren’t provided, so you need to have your own set of hex, trimming shears and drill bits. It isn’t my first tango with RCs so I already had everything I needed. 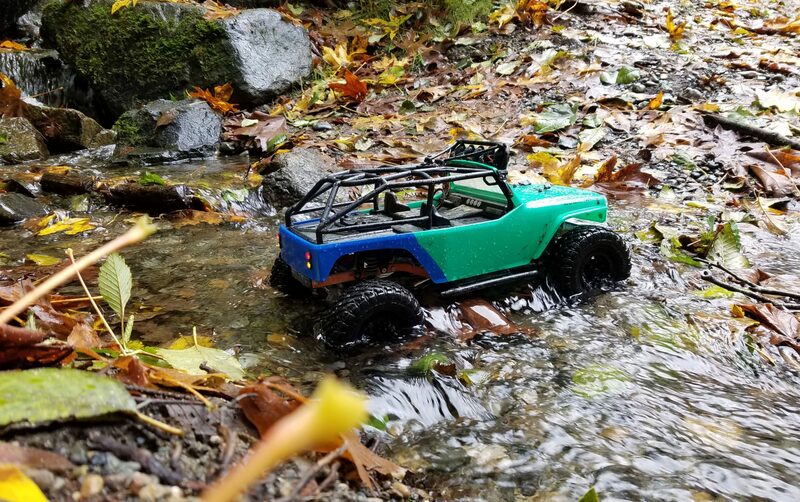 Axial doesn’t include any of the electronics you need to complete the car – the RTR includes everything except a battery, but has inferior components like an older transmission design, different suspension links and budget electronics. I upgraded my little Jeep Wrangler with a new motor, receiver and radio that I transferred over to the new Jeep Cherokee. My motor of choice is a highly-recommended Torquemaster Expert 35T motor from Holmes Hobby. It’s a brushed motor that delivers plenty of low-end torque and rebuildable. I paid $50 for the motor a few months ago. 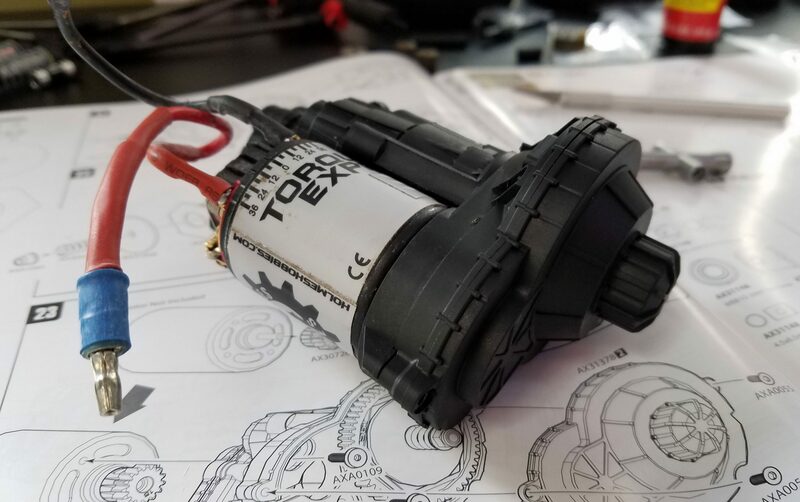 As a general rule of thumb, brushed RC motors are rated by a T (turns) rating, which represents how many times wire is wrapped around the motor armature. The lower the turn rating, the higher the top end while higher ratings translate to greater low end torque at the sacrifice of top end. Think of low and high turn ratings as the difference between a high-revving sports car motor and a truck motor that makes its power at lower RPMs. Also required is an electronic speed controller (ESC), which powers the motor and regulates voltage to the other electronics. I opted for a budget unit from Axial – the AE-5. Its waterproof, works with lithium-polymer (LiPo) batteries and the same unit I had in my little Wrangler. I’ve had great luck with the Axial AE-5 and submerge it completely quite often without any issues or failures. There are other ESC’s available that lets you program the power curve, like fine-tuning an ECU, but you’ll pay more. A steering servo is needed and there are plenty to choose from. I was given an Align DS615 (a rebadged Savox) servo from my dad and used that. Servo prices vary anywhere from $20 to $200, depending on how much steering power and smoothness you want. Controlling the RC car requires a radio and receiver. I use a Spektrum DX4s 4-channel radio with a SR410 receiver. Lastly are batteries, which I already had a few in my possession. You can use NiMH or LiPo batteries. LiPo is lighter than NiMH but requires a balance charger and shouldn’t be left charging unsupervised. I use mostly 2-cell (2S) LiPo batteries that deliver 7.4-volts with an occasional 3-cell (3S) battery good for 11.1-volts when I have the hankering for more speed. Before the kit even arrived, I ordered a transmission upgrade. The stock transmission contains a single gear, but it was designed to accommodate a second gear. SSD-RC sells a kit that includes all the parts needed to convert the stock transmission to a 2-speed unit. The kit includes a new upper transmission shaft, some gears and shifting fork. Gearing is configured for high and low gears, with the low range matching the stock ratio and ideal for low-speed crawling. High-range was my main reason for the 2-speed transmission upgrade. Low-speed crawling is fun, but I prefer more speed on straightaways, which the high-range gear delivers. A second servo is needed to shift gears on-the-fly and I opted for a budget waterproof Savox unit. I spent four days assembling the little Cherokee and painted it to resemble my Grand Cherokee. The chassis, axles and transmission were the easiest parts to assemble – simply cut the required parts off the parts tree and screw together with a dab of grease or loctite as needed. Assembling each of the four shocks requires patience and finesse due to the small parts. I suggest using a pair of tweezers to make things easier. The biggest pain was putting the body shell together. Painting and basic trimming was easy, but Axial included a lot of plastic detail parts for the side mirrors, door handles, tailgate beauty bar, headlight panel and roof rack. Each of the little detail parts require drilling tiny holes, which was extremely annoying. Axial marked where you need to drill with little dimples that took the guess work out of drilling. I got all the parts mounted with only one slightly-crooked door handle, after lots of cursing. 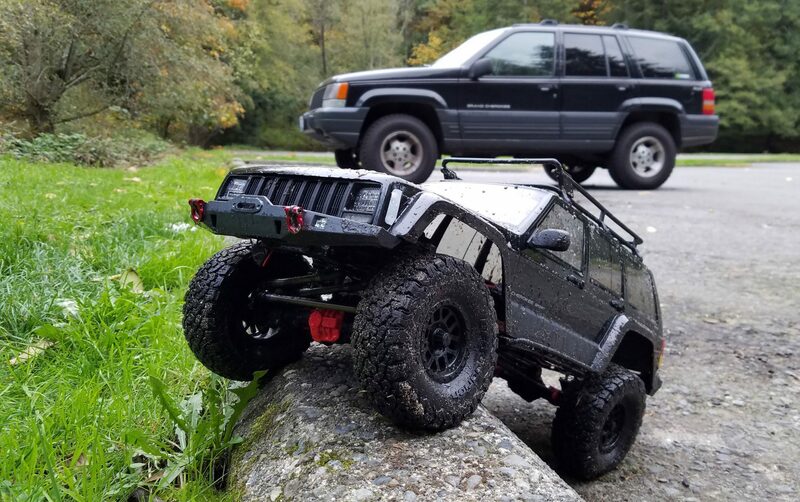 Parks with hiking trails are excellent places for RC rock crawling. They’re family friendly places that I can take my family too. 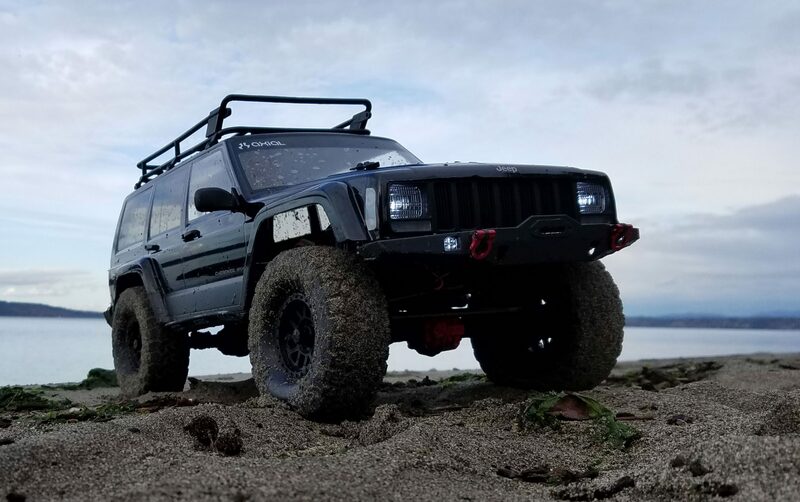 I took the little Cherokee out to Dash Point State Park in Federal Way, Wash. to drive it on the beach and across the little stream. I had no trouble submerging the little Cherokee completely in water and hooning it on the beach. The rocks surrounding the stream provided a technical challenge that required patience and the right approach angles to traverse. As a car enthusiast with kids, my newfound RC car addiction lets me build and modify cars without the required car insurance or parking space. It also provides a mini-offroading experience without fear of damaging my own car. I love my big Jeep Grand Cherokee, but it’s the only vehicle I own that can go further than 80-miles, so rock crawling or driving it across a river and causing potential damage isn’t something I’m keen to do. 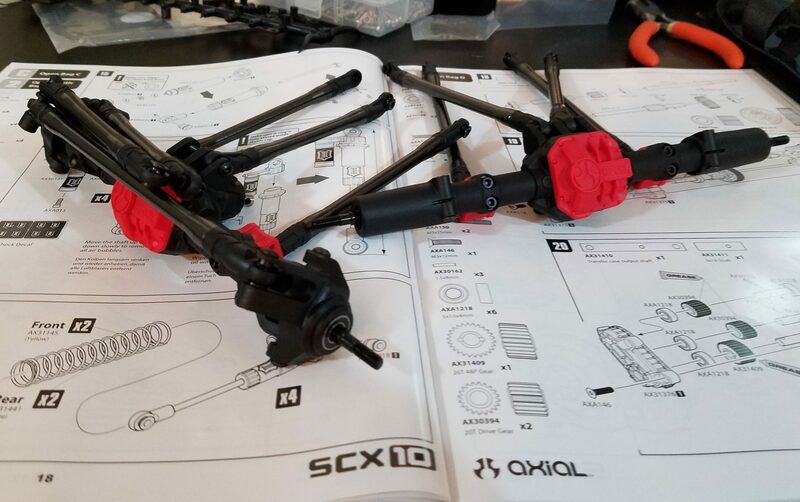 As for the Axial SCX10 II Jeep Cherokee kit, it was easy to assemble with the proper tools. Anyone that enjoys working on cars should give building an RC car kit a shot. I will warn that it’s addicting, as I’m always planning the next mod or upgrade. On the positive side, the mods and upgrades are a lot more affordable than parts for a real car. Hell, a complete RC car build from the ground up is cheaper than a new suspension for my Grand Cherokee.